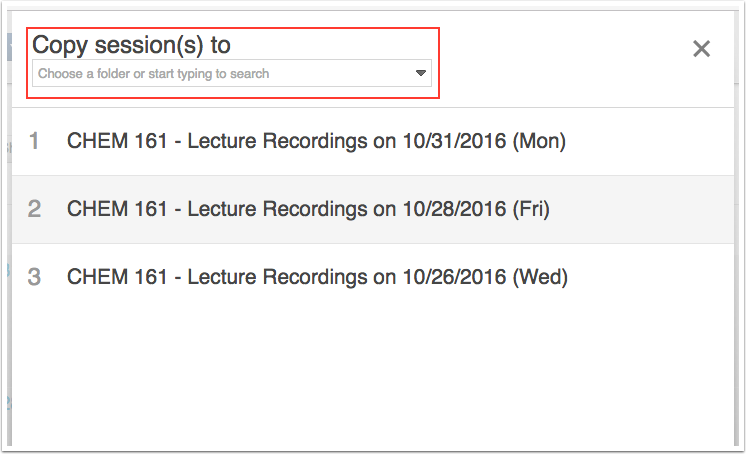 Canvas @ YaleInstructor Guides Media LibraryHow can I copy/move multiple items to another folder? In order to copy media to a new course or folder, please first ensure you have the new course set up in Media Library by going to your course page and navigating to the Media Library section. To copy media, and move multiple items at a time, you must access your media through the main Media Library page. You can either go directly to http://medialibrary.yale.edu/, or click the "Open in Panopto" button from your course Media Library page. To copy items, check off the media you wish to move and select "Copy"
Once you select "Copy" the media will be copied to the new location. The copy window will present a notification when it is safe to leave the page. To move items, follow the same steps, but select "Move"
Note that copying creates another version of the file in a different folder. Moving a file will remove it from the original location. Prev: How do I move my media? Next: How instructors and students can comment in video?